« The National Pandemic Flu Service – "Swine Flu Hotline"
This is a review of the John Fowler’s Caravan site at Widemouth Bay, near Bude in Cornwall. The site is described as a big and lively site. It is quite a large site, with a static caravan area and a touring / camping area. We stayed in a Gold standard caravan which as you would expect was in good condition and clean. It was not possible to park the car next to our caravan and instead parking was on the site road. 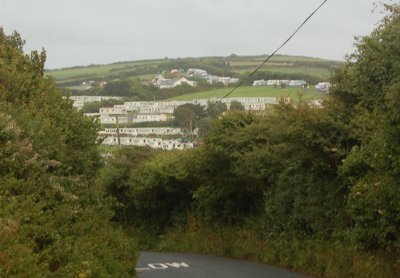 This appears to be due to the steep hill that the site is built on as it is possible to park next to some other caravans. There was a flight of stairs to get up to the caravan. The site is within walking distance from the sea, but the better beach is accessed via the car. There is a path down to the nearest beach which takes about 15 minutes, but the path is not really suitable for pushchairs. It is possible to get a pushchair down and I wasn’t the only one to do it by the looks of the tracks in the sand, but getting the pushchair back was a bit of a challenge. It was much easier using a carrier backpack rather than pushchair. To reach by foot go out of the site, turn left and then go onto the coastal path towards Widemouth Bay, then branch off the main path to the beach. 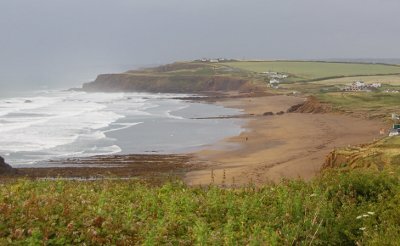 The better beach is found by driving towards Widemouth Bay and paying £3 to £4 for parking (less than 4 hours / all day). Another advantage of the beach down the road is that it has a lifeguard present (only during certain times but they were present when we went). There is an indoor swimming pool on-site, but changing facilities are very small and basic. They were also very wet and dirty by the end of each day. There is no baby changing within the pool, although the club toilets are just next door and we changed our baby on the tables around the pool. The site also has a crazy golf and outdoor children’s play area and an amusement arcade. The amusements were a bit small, and the “penny falls” machine was setup for 10p coins rather than 2ps which is what it was intended for (very expensive for children that want to play) and it didn’t work very well as the pushers were not aligned properly. There is a club with children’s entertainment including Freddie Fox, Trixy Rabbit, Kenny Badger, Paxo Chicken and Cheffy Chef. There is only one character at a time, but some evenings there would be two characters during the night (Freddie Fox and one other). There was also some cabaret entertainment, but we didn’t see much of that. In general it is a good site and we were happy with it. I would consider staying again. This entry was posted on Friday, July 24th, 2009 and is filed under Babies, Children, General, Holiday, Tourism. You can follow any responses to this entry through the RSS 2.0 feed. Both comments and pings are currently closed.